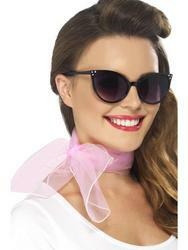 If Grease is the word at the party then this is the perfect accessory for you, it'll instantly transform you into Sandy, Rizzo or any of the other pink ladies from Grease. The officially licensed pink jacket features a fully functional zip to the front and is decorated with a small Pink Ladies embroidery to the chest and a huge statement making version to the rear. You'll be the one that everyone wants when you wear this fabulous Grease pink ladies jacket, perfect for a 1950s or Grease themed fancy dress party and a very popular choice for wearing on a hen night. Pink jacket with functional zip and Pink Ladies embroideries to the chest and rear.